I am starting my California vacation at a house – close enough to the beach to walk there barefoot – in Marina del Rey. 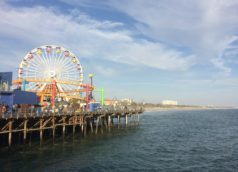 Last night we went up to Santa Monica pier (which is where Route 66 ends – I did not know that) and I had stuffed shrimp at Bubba Gump’s Shrimp Co.. 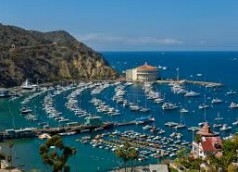 Note – From time to time I will post about my favorite islands around the world, starting today with Catalina Island. Catalina Island is located 22 miles off the coast of southern California, and is a world away from the hustle and bustle of Los Angeles. It’s a quiet, peaceful, laid-back island with no traffic.